“I come to praise drafting and not to bury it.” Not exactly the reversal of a quote you may expect in a Shakespeare play, but appropriate for our context. I was recently cleaning out my parent’s garage after my father passed away. There was a lot of “junk” that just never got thrown away as they moved from house to house along their 61 years of marriage. Mom wanted to go through it and just get rid of the stuff that Dad kept because she had no clue as to why he may have kept it. We tossed old parts and pieces from projects around the house. We tossed old magazines that were read and kept for reference, but never gone back to (how many of us do this). We tossed or donated so much stuff that was just collecting dust. Many of the items were placed back on the shelves as they were mementos of days gone by that mom could not part with yet. One of the things that we discovered was a box full of old building plans that dad had kept. My father was a contractor back in the 50’s and 60’s. He started at a young age as a manual laborer doing roofing and progressed on to start his own firm as a building contractor. He built many custom houses and apartment building (think mid-century modern) and he had kept a few of the plans that must have meant something to him. He did not draw the plans, but he built the designs that were conveyed on these now yellowed, cracked and faded prints. I grew up looking at these plans. My dad taught me how to read them and what they meant. He showed me what each plan was depicting, how they complimented and supported other plans and how it all made sense to the builder. I would sit and review these plans trying to decipher what they meant and why they were needed. I created in me a love for good plans. I saw many plans that were good and many that were bad. These early memories were the beginnings of my long design related career. Seeing these plans again reminded me of the value embedded in those artisans from days gone by and the need for passing on expertise from one generation to another. Over the next few posts I will present what I think needs to be passed from those that developed their skills on the drafting board to those who may have never used one. My conclusions are drawn from seeing the recent crop of those entering the job market with very adept technology skills but fewer skills at presenting a design in such a way that it is build-able. I’m old enough to have started with a drafting table. Sometimes I miss working that way. But alas, that too required ‘Standards’. OK! Here comes the old guy! Anyone remember working with ink on wax linens??? My first drafting job (as an apprentice) we worked on mylar and we still were updating the old wax linens for older projects. The good old days??? I have very fond memories of drafting on that old table. It’s where I learned how to tell a story with my drawings. I agree we need to teach the younger generation how to speak to the reader. How to make the reader see what we see. I have found the best way to do this is to teach the drafter to visualize what he/she is drawing. I agree as well. One issue I see is as we have transitioned to these modern tools that schools teach these new tools and do not teach drafting. As someone who has started teaching introduction to AutoCAD at a local community college there is no time in that class to teach drafting and still cover the basics of the program. Drafting is the art of telling the story as others of pointed out. It is an understanding of proper order and clarity of the drawings. What is and is not important. It seems that since the Architectural field has moved further away from a mentoring type profession that these skills are being lost. People assume that since they have a degree they know these, because when many of these principals went to school they where taught this. The problem is that many schools look at basic drafting as old technology because they attach it to that old hand drafting and think it is unimportant today. It would be nice to see a new class that focuses on these drafting principals. It need not cover lettering and pencil manipulation, but should teach the art of drawing organization, proper dimensioning practice, and of course how to tell the whole story. just landed om your site. Your table brings back memories; the many hours of drafting details, elevations, and the lot. The smells of the blue print machine (would wake up a dead horse, no wonder we didn’t fall asleep after lunch), the revisions, pencil sharpening, Loved it.. I started drafting before I was in Junior High and High School, all because I was already actively involved with Architects in my family; one which consisted of Mies Van Der Rohe. Hand Drafting became easy for me, long before I worked in an A&E Office. I am talking the 60’s. I still sketch and render by hand today, so much faster than CAD, because the eraser works like charm and no batteries to replace! However, what it swtill boils down to….is the ‘Artist’ eye to finalize a design, a detail, a floor plan. I make it look good as well as buildable!!! I cannot tell you how many times in past; how many concrete curb details that I have drawn from office to office….probably hundreds….way too many! Back to hand drafting…is it a lost art? Yes, but not to a few of us. However, to maintain a business ‘edge’ no one cares to see hand drafted plans anymore! Today, it is AutoCAD or Revit and the name of the game is….when can you get me my permit? This statement hasn’t changed since the 60’s and I don’t think it is going to change in the next 100-years either! I am the President of a midsized company in a niche design/build field that employs a couple of design professionals. I am reaching out to this community because I want to help my company’s Drafting staff tell a clearer story. We regularly get comments when we do design build work that the plans are fragmented, don’t tell what the work flow is clearly, although all the details are there they just don’t tell the whole story etc etc. is there a book or site where I can steer my staff toward a clearer understanding of how to tell the story of our projects in a clear way so I don’t have to replace them? Or is all lost and I need to start over and train someone who knows the pace of a plan book and only needs to understand our products and industry…??? I can certainly understand your plight. As stated, I think that this “art” is not being passed on. One suggestion would be to hire an experienced hand that has worked in your industry for some time and let them teach the others. 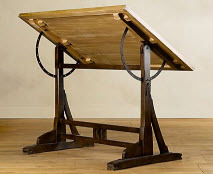 Hi there,, I have an old drafting table and i need the level adjuster stabilizers ( half circles) on the side. Do you know where i could get some of these?